I briefly touched upon shooting in continuous mode in the article on how to freeze a moving object, but we’ll look at how using burst mode can increase your chances of capturing a great shot. Burst mode is also known as ‘continuous’ mode, depending on which brand of camera you have. The speed of the burst also varies according to what make and model of camera you have. If you are lucky enough to own a top-of-the-range professional camera like the Canon 1D, the speed of the burst (also known as ‘frames per second’ or ‘fps’) is very high. For professional sports and wildlife photographers, the rate of the fps is very important, as it means they have more chance of capturing that amazing frozen-motion shot. For amateur and hobbyist photographers, the fps doesn’t matter so much. Some cameras will only shoot two or three frames per second, while the pro ones will shoot ten or more per second. You need to be able to find your burst mode before you can use it, so take a little time to look at your camera’s instruction manual. On Canon, you can access it through the quick menu, or ‘Q’ button on the back. You’ll see the options for single shot, low speed continuous, and high-speed continuous mode. You simply choose the one you want, and the camera will shoot in that mode until you change it again. What Is Burst Mode Used For? As I mentioned in the ‘How to Shoot a Moving Object’ article, burst mode is great for taking photos of a moving subject, such as sports, pets and kids. It’s also very useful if you’re doing group photographs. It’s very hard to get everyone all looking at the camera and smiling at the same time. There’s always someone blinking, yawning or looking away! If you use burst mode, you stand a much greater chance of catching everyone looking good. You can also experiment with burst mode for portrait shots. People tend to tense up and look unnatural when posing for a photo. If you shoot a burst instead of a single shot, you may capture them looking more relaxed, or catch a fleeting look or emotion that you would miss if you used single shots. You can combine photos that you have shot in burst mode into one final image by using special software, or you can just pick the best one. Another good use for burst shots is to make a stop-motion video. Take hundreds of continuous shots of a moving subject, then put the photos into a video editing program such as Windows Movie Maker. Set the frame display rate to a second or less, and play the sequence. You’ll get the whole range of motion from those still images, like those flicker books you used to make when you were a kid! There are a few things to be aware of when considering using burst mode. One of them is focusing, which I explained in the moving object article. You need to have your autofocus set to continuous, AI or servo mode, depending on what make of camera you use, and you need to set your focusing point. Continuous focusing can’t always keep up if you’re shooting a lot of frames per second, so expect to have at least a few blurry shots. Your camera needs to be able to write the images to the memory card quickly when you’re shooting in burst mode, and sometimes it can become overwhelmed by the sheer number of images it has to write. It then takes a break from shooting, so it can buffer the images until they can be stored on your memory card. While it’s doing that, you can’t shoot any more images, and you may miss some great shots while you’re waiting! Having a high-speed memory card can help reduce this problem. They cost more than standard memory cards, but the extra speed in storing images is worth it. Storage space also becomes an issue when you shoot in burst mode. Make sure you have plenty of memory cards to hand, because burst shooting burns through them at a high rate, particularly if you shoot in RAW format. The same goes for your batteries – burst shooting can drain them very quickly. Bear in mind that when it comes to editing your images after shooting in burst mode, you will have to wade through hundreds, if not thousands of shots to find the ones you want to keep. Burst shooting can be great, but you need to think beforehand what you want to achieve, and how many frames per second you will want to use. If you just blast away on the highest rate you have, you’ll end up running out of battery or memory cards before the event is over, and be left with many thousands of bad images to sort through to find a few really good ones. 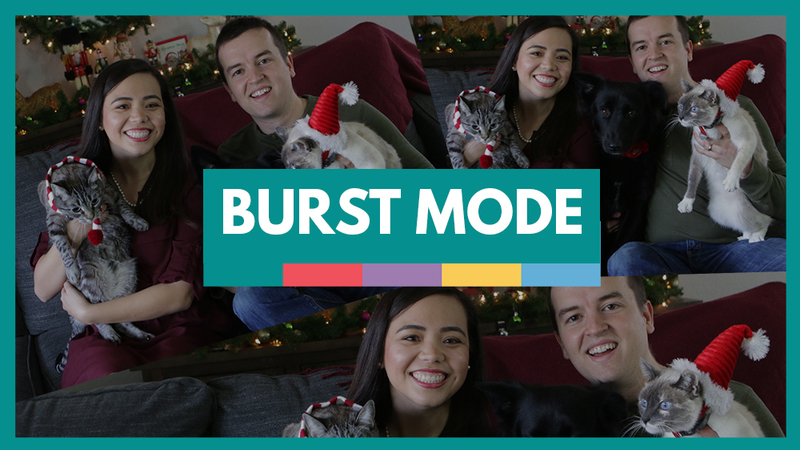 Have you tried using burst mode before? What are your thoughts or handy tips for getting great shots while using it? Have you tried making a stop-motion video with your continuous shots, or making a single image out of a sequence? Next time, we’re going to be discussing how to shoot great macro shots, with a step-by-step tutorial.